If this were Amazon.com or Netflix, you'd see "People who like this also like Banh Mi Che Cali." This is true. If you are a Banh Mi Che Cali devotee like I am, you'll also like Banh Mi Cho Cu. If Banh Mi Che Cali was Pulp Fiction, I'd have to say Banh Mi Cho Cu is Reservoir Dogs, spare, lean and mean--the OG of banh mi. I can quote Pulp Fiction and have tried all of Banh Mi Che Cali's sandwiches, but once in a while I need to go back to pay my respects. 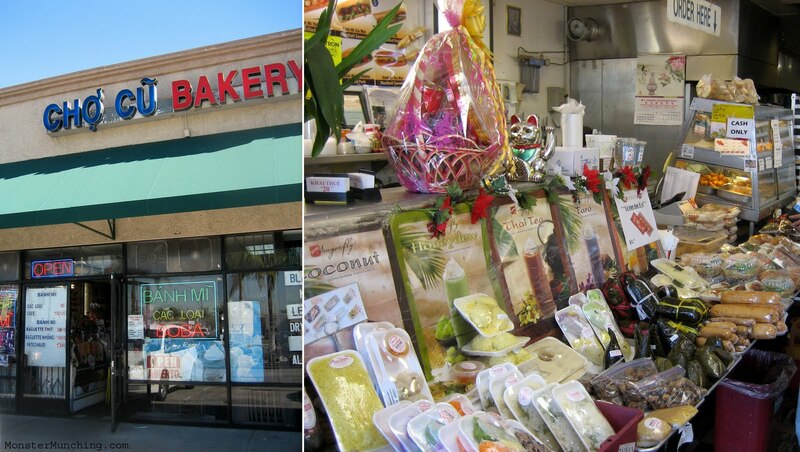 The bakery, as with most things noteworthy in Little Saigon, is crammed between a seedy liquor store and a laundromat. Every inch of counter space looks as if a cornucopia of foodstuffs exploded and what you see is the shrapnel. There are Vietnamese food-to-go products of every imaginable permutation--rice and meat wrapped in cellophane, banh cuon rice-noodle sheets wound around meat, sticky rice this and that--all stacked on top of each other in a chaotic tangle of colors and textures. On the side next to the register, cha gio (egg rolls) and pate chaud (Vietnamese flaky meat pies) heat inside hot boxes. But raison d'être, of course, is the banh mi ($2.50 each; or buy two, get the third free). The dac biet, or house special, called to me: a combo of meats (mostly pork) stuffed inside a crusty baguette. Though it is like Banh Mi Che Cali's sandwich in many ways, the banh mi scholar will detect a few differences. The cucumbers are cut crosswise rather than lengthwise. The jalapenos and the usual carrot and daikon pickles are applied with a lighter touch. Also, no measurable amount of mayo is used. What you taste is predominately the bread and the meat. You chew the gelatin jiggle of the pork fat from the slice of roast pig. You perk up at the salty funk of liver pâté. And you relish the smoothness of the white Vietnamese ham called cha lua. These are layers of pork-on-pork action, hugged by the pillow of what could be one of the best baguettes in Little Saigon--a bread with the lightness of helium, a crusty crumb that shed itself all over my shirt, and a refinement that plays against the rustic, uncensored personality of the cold cuts. 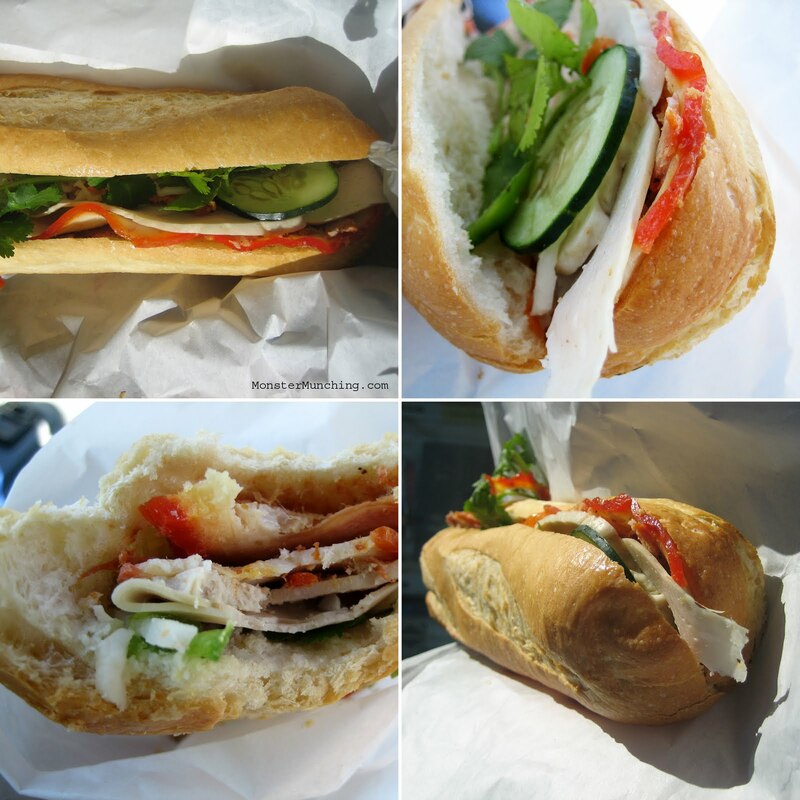 If you're a banh mi lover, I quote Vincent Vega when he said, "Yeah baby, you'd dig it the most!" This looks tasty. I am bothered that it doesn't have much mayo in it because I actually quite like that part of the sandwich. Are you saying that this bread is as good as Banh Mi Che Cali or better? Because if better, than I really need to head on over there. Not sure how you came up with the idea to put Pulp Fiction and Banh Mi in the same post but you made it work. Used to stop by this place all the time after church. The pastries are great here too, and my friends used to love the boba. Nice write up! Keep it up. I don't know why so many people are down on the Lee's bread. I actually prefer that style. Its the amount of filling I have a problem with. Will have to try this place you wrote about. I dislike the bread at Lee's. Cuts my cheek up royal. Banh Mi Che Cali's is kind of softer. Is this one somewhere in between? I haven't done a head-to-head comparison (though I should), but Cho Cu's bread is definitely crustier on the outside than BMCC. The evidence was all over my shirt! I'm sure I like this bread over BMCC's ...though, I agree with Madison, I love that ultra eggy mayo BMCC uses. Hey Elmo - When I was asking our friend "Beach" about finding bread that pretty close to what we had in VN, this is where he took me. It's still a bit more substantial, and not as airy.....but it was pretty close! If it pleases the Don of Little Saigon, then it's good enough for me!